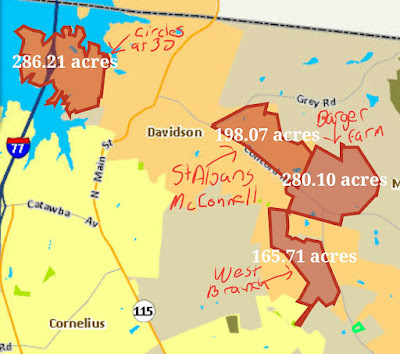 The proposed Rural Area Plan (RAP) rezonings that will impact over 2000 acres primarily in Davidson's ETJ moved one step closer to passage Monday night. 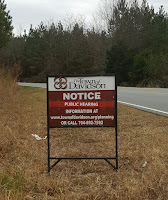 According to someone in the room, at its meeting Monday evening the Planning Board unanimously passed what are called "consistency statements" with Planning Board Chair, Mickey Pettus, pointing out to the Planning Board members that they were voting on whether or not the proposed rezonings were consistent with the Rural Area Plan. Town Hall confirmed this morning that this is all that is needed from the Planning Board. These consistency statements are required as part of the process. They do not however imply whether or not the Planning Board approved of them as a good idea. In that sense, this is not a surprising result. Throughout the debate, people opposing the rezonings have explicitly not been attacking them as somehow "inconsistent" with the RAP. In fact most people have said the RAP is a good plan including the fact that it permanently protects about 700 acres as Rural Reserve that can have no development. What people are concerned about is the timing for rezoning the rest of the impacted acres. They are concerned about the hard fact that doing these rezonings now without proposed plans for development is simply throwing a bone to developers. It's making their job easier by granting them new by right privileges under new zoning without having to present plans first. All of these concerns are valid despite vigorous protestations to the contrary from Town Hall staff and electeds. Flawed ideas need to be fought every step of the way. If they aren't, you end up with things like MI-Connection and the I77 HOT lanes. Unfortunately, nobody on Davidson's Board seems to see things that way in general and certainly not with this RAP rezoning specifically. Last week when the Board of Commissioners sent these rezonings to the Planning Board for its recommendation, it did so unanimously. After repeated questions from aShortChronicle the Board steadfastly refused to remove this item from the consent agenda and vote on it separately. Consent agenda items imply unanimous approval of an action by the Board. In an email to aShortChronicle, Commissioner Rodney Graham defended this saying this request for input from the Planning Board was just standard procedure and that he couldn't imagine any Commissioner not following procedure and voting for getting that input. Now, they have it. The Planning Board says these rezonings are "consistent" with the RAP and this process moves one step forward. The next opportunity for citizens to review this plan is this Saturday at Q&A forum at Hopewell Baptist Church from 9:00am to 10:30am. 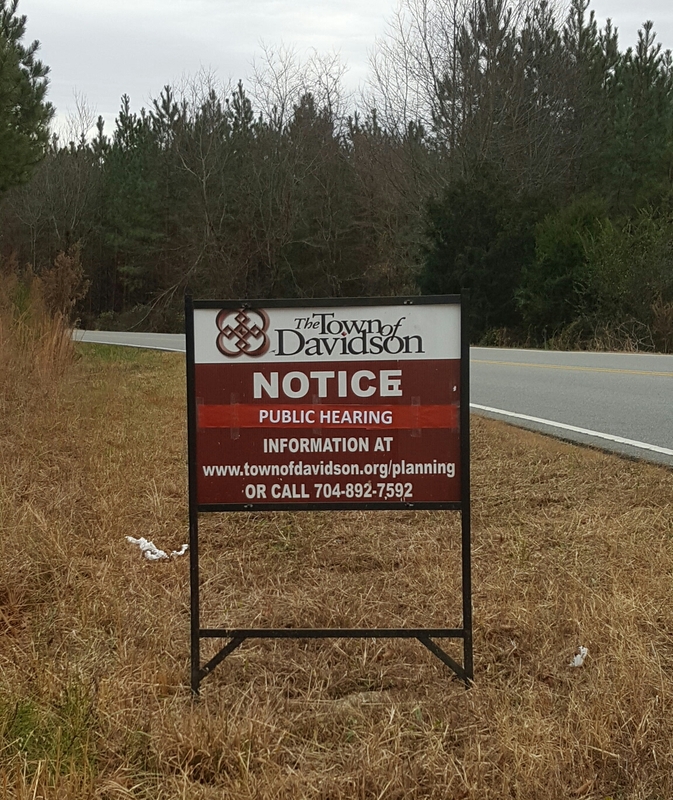 The Town of Davidson has received multiple serious responses to its RFP for the development of 18 acres off of Beaty street. Nine firms inquired about the project, and six actually submitted proposals. The due date for proposals was 1/18, and last week aShortChronicle obtained copies of the submissions. Per Assistant Town Manager, Dawn Blobaum, the initial selection process plans to move forward quickly. The Beaty Street Selection Committee driving this project will meet on 1/31 to short list the proposals for interviews within the next two weeks and plans are to present at the February 28th work session. The Town plans to have a public input session prior to the 2/28 Board work session an is targeting a March 14th final decision by the Board. This effort could bring 100s of new housing units as well as significant commercial development to the Beaty Street/NC115 area in the next few years. The largest residential proposal would be over 300 apartments. The largest commercial proposal rivals what was envisioned by the Catalyst Project and includes a 100 room hotel. Each proposal includes $550k towards improving the Beaty St/ NC115 intersection, but they vary wildly in how much developers appear to be willing to pay for the land in addition to that - ranging from $250k to $2.7m. Most proposals involve someone with close connections to Town Hall. It will be interesting to watch as these insiders battle it out for the right to develop one of the most important land holdings of the town. The first inkling into this will be who makes the short list. Davidson residents need to stay on top of this one as it will be incredibly impactful to this corridor of town. Town Hall must ensure that taxpayers get the most value out of this resource. 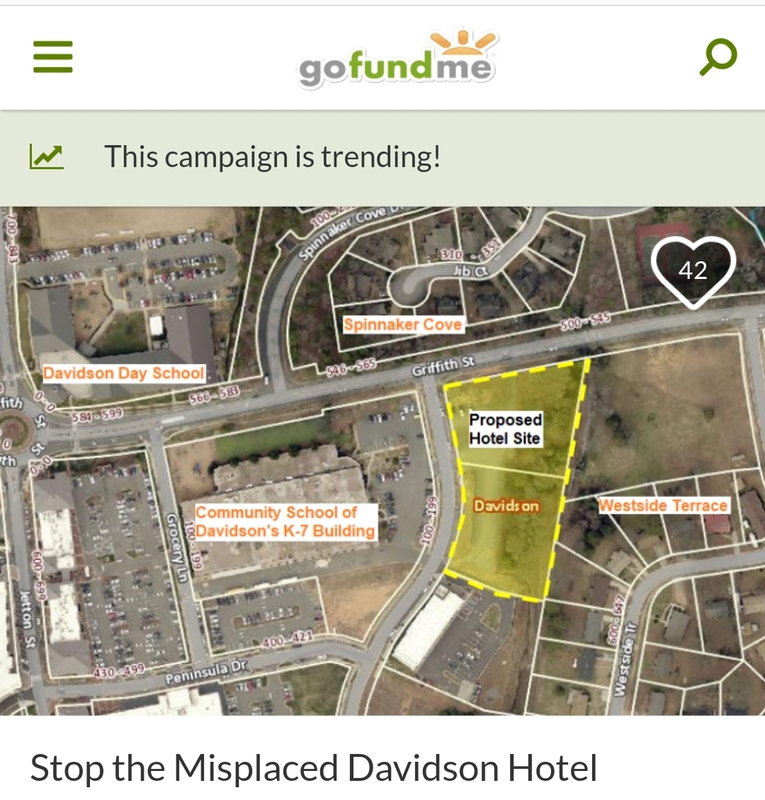 It's not something that voters will tolerate if once again land is given away to support pet projects, or if it appears the best interests of those with Town Hall connections are favored over the interests of those who pay Town Hall's bills. Contact the Board at Board@townofdavidson.org to let them know you will be watching. aShortChronicle will be taking a hiatus from blogging and the columns at the Herald Weekly for at least the month of January. As many readers know, this is not my job. It's just a hobby, and I don't get paid a dime. With the new year kicking off, I have a number of other important priorities that need to move to the front of the line. Dont worry though. We will be back! There are too many important things coming in 2017 to let the silliness and shennanigans of local government go unreported. 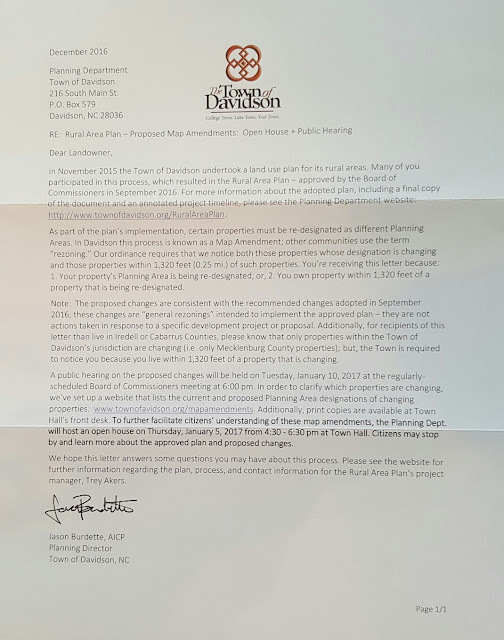 Many homeowners on Davidson's east side received what was likely an unwelcome surprise on Christmas Eve with the arrival of a letter from Town Hall. 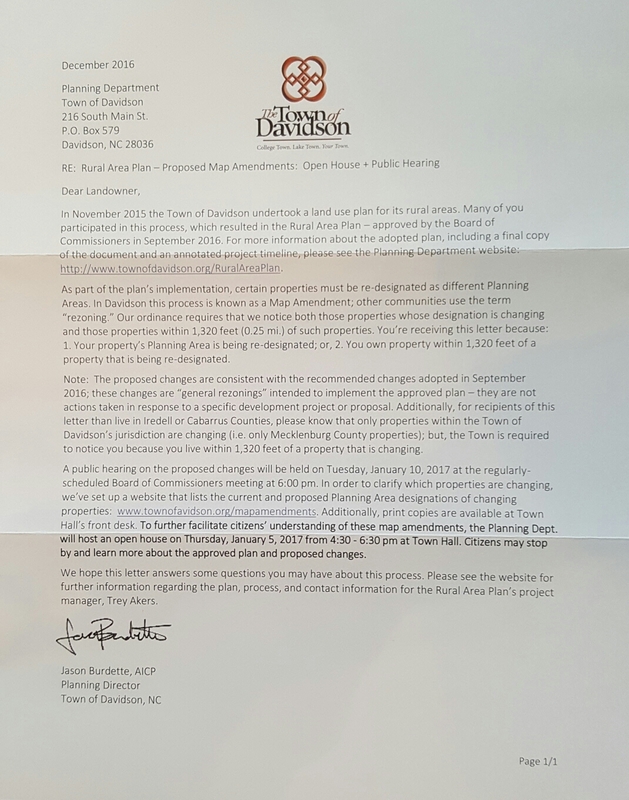 Landing at an inopportune time considering the holidays and with many people traveling, the letters were to notify property owners that nearby land was up for rezoning. And we're not talking about something minor. What may be surprising to many is that these rezonings being done under the auspices of the Rural Area Plan will actually make it much much easier to develop land that is currently rural. To give you an idea of how large an impact this could be, look at the below map for some perspective. 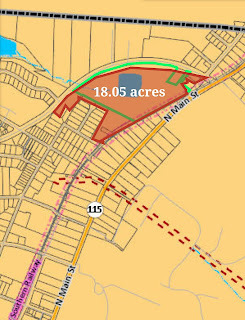 The areas are approximate due to the use of the drawing tool on the county's Polaris site. 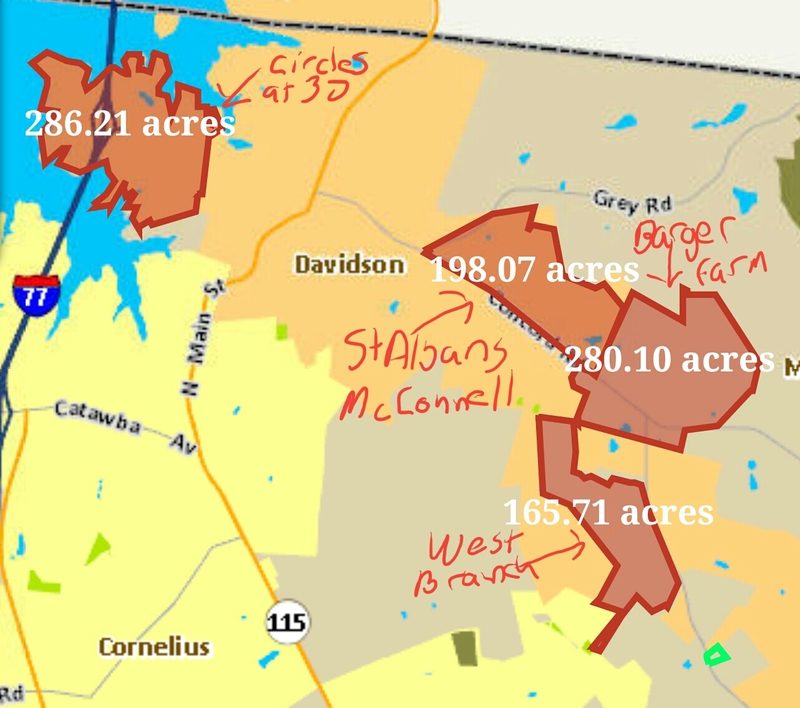 The Barger Farm is a massive property and the 280 acres shown here is just a portion of it. This portion will be rezoned as Neighborhood General with portions around the roundabout at Davidson-Concord/Rocky River being rezoned as Neighborhood Services. These designation changes will make dramatic new development "by right" without needing to go through rezoning at the time development is actually proposed. Making these changes now cedes significant control from the the Town to the development community. While it is certainly reasonable and correct for land owners to expect to do something of value with their land, the Town taking this step proactively without any proposed actual development plans makes it much easier to ram through unacceptable projects when they do come up. Commissioner Brian Jenest voted for the rewrite, and his firm did the land planning for the West Branch project. If the West Branch example doesn't bother you, how about the other two areas highlighted above? Do you think it is a good idea to have pre-approved zoning for a high density development the the size of a combined McConnell/St Albans neighborhood? What about something the size of the entire Circles@30 area? 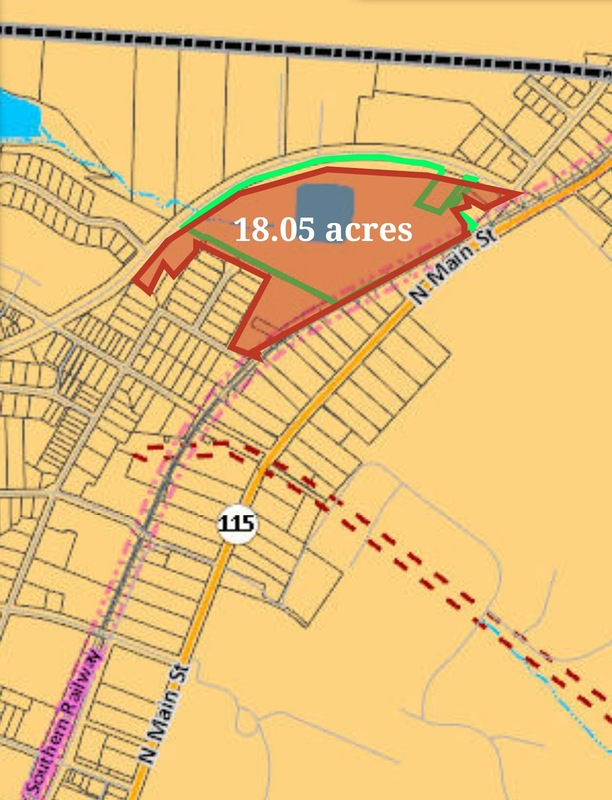 Now consider that this portion of the Barger Farm is just one area that will be rezoned by this Town proposal. More than 1000 additional acres will be approved for more intense development as part of this effort as well. Those acres will mostly be in the less dense Neighborhood Edge category, but they will still provide by right approval for an untold number of rooftops. Neighborhood Edge requires 40% open space and does not have multifamily, but also has no density cap. In light of all this, these rezonings should not occur until there are official projects for an area. This would not prevent the projects from occurring, and the Rural Area Plan should be used as the guide for approving them. However, holding off on the rezoning changes would allow the Town more control in the event a developer down the road proposes something that may be inappropriate for the area but may be "by right" under the new zoning. Residents should plan on attending the open house this week on January 5th from 430-630pm and the official Public Hearing at the January 10th Town Board meeting at 6pm.